We guessed their new recording would present an intelligent program. Around the Cello and piano sonata op.65, we have: Barcarolle op.60, Three mazurkas op. 63, Waltzes op.64, Mazurka op. 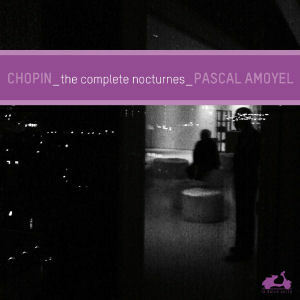 67 n°4 and Two nocturnes op.62. Three mazurkas op. 63 : The author of the book points out that the 2 slower ones belong to the kujawiak genre, a dance from central Poland, the other four Polish national dances being: krakowiak, mazurka, oberek, et polonaise. Cello and piano sonata op.65 : We are not familiar with this work and thus listened several times to Rostropovich / Argerich before tackling this new version. Especially the first long movement was not played at the creation by Chopin and Franchomme, considered too difficult for the public. We had this impression with Argerich / Rostropovich but it completely disappears here: it is played more finely, more freely, more dancing and singing, and our ‘national Jacqueline du Pré’ is amazing. Here we find his poetic cantabile; it is a new interpretation; for example, 1 is interpreted here a little faster. 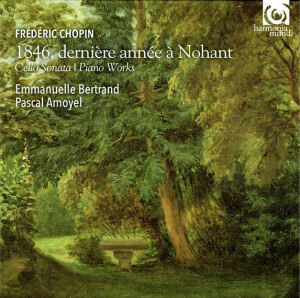 A CD to listen on headphones while walking in the gardens of Nohant by a beautiful summer evening!